Fifty years ago, 29-year-old Ted Ernst met with members of the Manhattan Beach Fire and Police Departments to map out the safest and best course for a community bicycle race within the beach city, where he had noticed the growth of cyclists pedaling their way up and down The Strand. 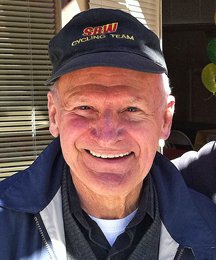 Ernst was the owner of Ted’s Manhattan Cycles and in 1961 founded the South Bay Wheelmen. City officials welcomed his idea. On Sunday beginning at 7 a.m., the Chevron Manhattan Beach Grand Prix will celebrate its Golden Anniversary. It has grown to become not only one of the oldest single-day cycling events in the nation, but one of the premiere competitions on the United States Cycling Federation (USCF) circuit. The event draws up to 10,000 spectators and nearly 1,000 racers in various categories. The challenging and technical 1.4-mile course has been described as a “bent paperclip.” It circles clockwise past Live Oak Park, up Valley Drive and down Ardmore, from 15th Street to Pacific Avenue. It features two long straight-aways, two sweeping 180 degree turns, and 50 feet of climbing per lap. A headwind on the downward leg makes a breakaway difficult and stresses the importance of team tactics going into the final turn. With the exception of the removal of the Santa Fe railroad tracks and the islands now standing in the final turn, the course has been the same since the inception of the race. In recent years, the Manhattan Beach Grand Prix has been held on the final Sunday in June, but that wasn’t always the case. “The race has been on Labor Day weekend and on the Fourth of July. As the event has grown, we’ve worked around the calendar of the Cycling Federation. Because we have an earlier summer in Southern California, the end of June has become a convenient time for many top riders to come and compete in the event,” Ernst said. Ernst recalled having to alter a race at the last minute during the 1960s. Ernst laughed while remembering a tandem race in the 1970s. With nine races slated, this year’s edition of the Manhattan Beach Grand Prix will have a slightly different schedule than in previous years and include extra attractions. “Instead of holding the popular kids races after the final men’s pro race, we’re holding the event earlier in the day, breaking up the pro competition so the youngsters aren’t so tired from waiting around all day,” Ernst explained. The Chevron Manhattan Beach Grand Prix kicks off with the Cat 4 40-minute race at 7 a.m. followed by the Cat 3 competition of 55 minutes at 7:45 a.m. The pros will be competing for a $21,500 purse. The Bill Shiozaki Memorial, featuring Masters 55/60+ riders (40 minutes), ensues at 8:45 a.m. followed by the Masters 45 1-4 division (45 minutes) at 9:30 a.m.
A pair of 50-minute races follow with Independent Bike Shops sponsoring the Master 35 1-4 race at 11:15 a.m. prior to the Women Pro 1-3 competition sponsored by CliffBar and Chevron at 11:15 p.m. The Kids Races commence at 12:10 p.m. with each participant receiving a T-shirt and medal. Entry fee for Kids Races is $5. Elite cyclists continue the day’s festivities with the 50-minute Cat 2 race, sponsored by Ted’s Manhattan Cycles, starting at 1:10 p.m., followed by the grand finale when Chevron hosts the 80-minute Pro 1 competition, beginning at 2:10 p.m.
Online registration at www.mbgp.com closes at 9 p.m. Thursday, June 23. Walk-up registration will be held Saturday, June 25 at the start/finish area from 3-5 p.m. A late charge of $10 will be added to those who register on race day. For those riding their own bikes to watch the races, Ernst said there will be secured valet parking provided by Beach Cities Cycling Club. Along with the usual food vendors and exhibitors, this year’s event will include an Antique Bike Show, presenting a progression of cycles, from those used in the first Manhattan Beach Grand Prix to the present. Those who own bicycles more than 30 years old are encouraged to display their antiques at Sunday’s event, which will also feature a cycle-related mini swap meet. For more information or to register a bicycle for viewing, contact Matt Gorski at 562-773-4667 or mbgpshowandswap@gmail.com. Along with Chevron, which has served as title sponsor for the past 20 years, the Manhattan Beach Grand Prix includes additional sponsorship from Helen’s Cycles, TalkRadio 790 KABC, Honda, Palos Verdes Bicycle Center and Cytomax© Sports Performance Drink. Although Ernst sold Ted’s Manhattan Cycles to Manny Felix in 2006, the 79-year-old Palos Verdes Estates resident remains active in the racing community. The South Bay Wheelmen, along with the Lions Club of Manhattan Beach, provides dozens of volunteers for the Manhattan Beach Grand Prix, which draws contestants from six continents. Ernst’s father, Ted, Sr. began cycling in Germany in the 1920s and worked as a bicycle mechanic. In 1929, the elder Ernst moved to Chicago where his son was born. In 1947, at the age of 15, Ernst began racing, reaching the level of Category 1 in 1950. He would go on to participate in the World Championships and nearly made two Olympic teams. In 1960, Ernst moved to California, taking a job as a bike mechanic in Manhattan Beach. After only a few weeks, he was given the opportunity to purchase the shop. Ernst continued to race well into his 70s. He was inducted into the USA Bicycling Hall of Fame in 2006. Ernst is proud of how the Manhattan Beach Grand Prix has grown. 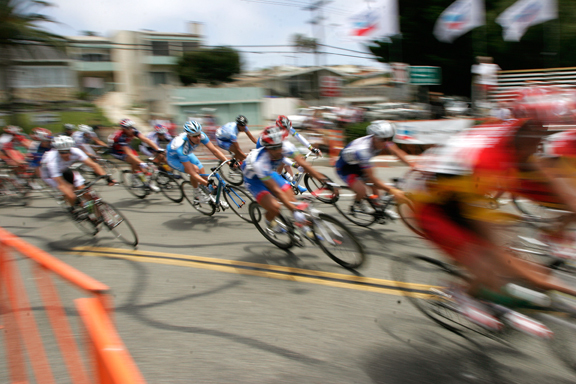 The race has featured numerous up-and-coming riders along with many Hall of Famers, Olympians and Tour de France competitors. Bob Tetzlaff, a member of two Olympic teams in the 1960s, won the inaugural Manhattan Beach Grand Prix and was voted into the Hall of Fame in 2003. One of the top racers in the 1950s and 1960s, Jack Disney also competed in the Manhattan Beach Grand Prix. The five-time National Champion competed in the 1956, ‘64 and ’68 Olympics before being inducted into the Hall of Fame in 1988. Now 63, Kenny Fuller raced in the first Manhattan Beach Grand Prix and was a member of two Olympic teams and a world champion. The Corona del Mar resident is still racing in his age category and winning national championships. He placed first in the Master 60-99 category April 30 at the San Luis Rey Road Race and April 23 at Devils Punchbowl. Fuller won the USA Cycling Masters Road National Championships in 2010 and plans to race Sunday in his age category at the Manhattan Beach Grand Prix . Another veteran of the Manhattan Beach Grand Prix was World Champion Steve Hegg, who represented the USA at the 1984 Summer Olympics in Los Angeles, winning the gold medal in the 4000m individual pursuit and silver in the 4000m team pursuit. In road bicycle racing, Hegg became the first three-time winner of the United States national individual time trial championship, winning the elite men’s race in 1990, 1995 and 1996. In 1994, Hegg captured the United States national road race championship and was inducted into the Hall of Fame in 2006. The list of notable riders includes a pair of 1999 Hall of Fame inductees. Eric Heiden, also know for his speed on the ice rink, raced in Manhattan Beach in 1985 and Wayne Stetina won the race riding for the 7-11 team during a career in which he earned five National Cycling Championships and five Masters National Cycling Championships. 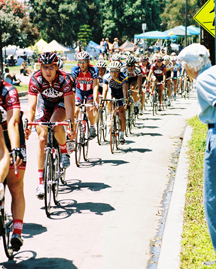 After competing in the 1988 Olympics and the Tour de France, Scott McKinley won the Manhattan Beach Grand Prix in 1994. Juan Jose Haedo, a rider from Argentina, won the Manhattan Beach Grand Prix in 2006, a year prior to capturing the championship of the Amgen Tour of California. This year’s field continues in the long tradition of accomplished racers. Scheduled to compete are Three-time winner of the Manhattan Beach Grand Prix Rashaan Bahati (Pista Palace); heavy favorite Jonathan Cantwell (Fly V Australia) who is one of the top sprinters in the world; Hilton Clarke (United Healthcare), the No. 3 ranked rider in the USA; one Tony Cruz (Cash Call Mortgage), one of the top all-time pros in the USA; 2010 National Champion Chris Demarchi (Pista Palace) and; Andy Jacques-Maynes (Bissell), a top US Pro and four-time National Champion. Members of the South Bay Wheelmen will also participate as the club continues to excel in competition, enjoying a weekend of stellar race results, especially in the State Team Time Trial races held June 11. Lynette Rock was part of the team that took first in the Women’s tandem, where two riders pedal on the same bike. In the mixed team event -– consisting of two men and two women — South Bay Wheelman and Wheelwoman Robert Minn and Lane Reid plus two non-Wheelpersons took first. In the two-person time trial, Wheelman Leo Longo teamed with a non-Wheelman to take second in the men’s 60+ event, while Wheelmen Alan Becker and Bruce Steele took third. On June 12, at the CBR Bailey Bike Criterium in Dominguez Hills, Wheelman Luis Che took second in the men’s 40+ Category 4/5 race; Bobby Unverzagt took third in the men’s Category 4/5 race; and Neva Day took third in the Women’s Category 1-3 race. Meanwhile, at the Ontario Airport Criterium on the same day, Wheelman Mike Flemming took third in the men’s 60+ race. A criterium is a race on a closed course, usually 1 mile or less, where riders race a certain number of laps, or for a certain length of time. The South Bay Wheelmen kicked off the summer in good fashion. At the California Bicycle Racing Memorial Day Race on May 30, Wheelman Luis Che won the 40+ category 4/5 men’s race, also placing 4th in the 30+ race. Paul Che placed 8th in the Pro men’s race, the most difficult race of the day and Mike Fleming placed third in the 60+ men’s race. SBW women also had a great Memorial Day weekend. Rock won the state time trial women’s tandem race with Julie Kaplan. The South Bay Wheelmen has more than 100 members, including racers and recreational cyclists and hosts a number of regular rides throughout the week. The website at www.southbaywheelmen.org has information on rides and other club activities. Ernst feels the Manhattan Beach Grand Prix is one of the growing number of races that help American riders in Olympic competition. Although he touts the elite racers who have competed in the Manhattan Beach Grand Prix during the last half century, Ernst gets equally enthused when talking about the kids races. It’s just Ernst’s way of re-cycling the popularity of the sport.